The subject of Design Technology provides students with the opportunity to combine knowledge and understanding with practical action. The core experience is of creativity – the engagement of students with practical tasks that lead to the making of quality products. We believe that the teaching of traditional practical skills still has an important place whilst we wholeheartedly embrace new technology. The satisfaction and joy that students gain from making something themselves fulfils a fundamental need in their personal development linked to feelings of confidence and self-esteem. As well as the core activities of designing and making, students will gain valuable understanding in such areas as healthy lifestyles, community design, enterprise and innovation, cultural diversity, sustainability and the global dimension. At present the department consists of five teaching staff, each with skills across the subject. We have a recently refurbished Food Technology room and CAD/CAM centre which is well-equipped with state of the art equipment and machinery. Product Design is taught in a multi-area workshop which is also well-equipped. Building skills and knowledge through project work. 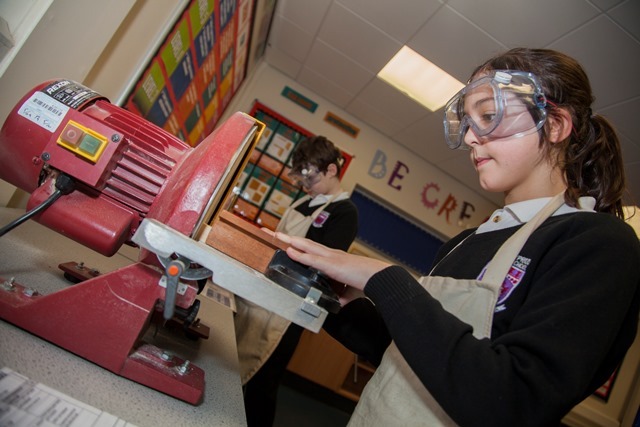 Students in years 7 and 8 undertake design and make tasks in a variety of material areas; Food & Nutrition, Engineering and Product Design. All students have 1 lesson per week in years 7 and 8. Projects are on a 12 week carousel rotation. In Year 9, pupils have the option to select one of the focus areas that they studied in years 7 and 8. For two hours a week, and no carousel, this develops both their skills and knowledge of the subject should they decide to opt for it as a GCSE. Students acquire a broad range of subject knowledge and draw on disciplines such as mathematics, science, English, computing and art. Students learn how to take risks, becoming resourceful, resilient, and enterprising with a wide view of the world. They develop a critical understanding of the impact of our decisions on daily life and the wider world. We believe that high quality education in all courses offered under the umbrella of Design Technology make an essential contribution to the creativity, culture, and well-being of our students now and in their future.